A GAMER'S WIFE: The Ultimate Gender Reveal Cookies! The Ultimate Gender Reveal Cookies! My favorite gender reveal dessert would absolutely be SugarDerby's Gender Reveal Chocolate Chip Cookies. How do you keep the inside color a secret without covering the pastry entirely in frosting? Cover the colored cake with cookie dough instead! 1) Mix white cake ingredients as directed. Add 10-20 food coloring drops and mix until consistent and dark enough in color. 2) Bake as directed in a 13"x9" pan. Cut off edges (since they tend to be "crispy" and the cake balls should be nice and fluffy). I also shaved off the top and bottom surfaces since they came out brown and I didn't want the cake balls to be brownish-blue. 3) Crumble the cake in a large bowl with a fork. 4) Use 1/2 to 3/4 of a container of frosting and blend together into the cake crumbs with the fork (or your hands) until smooth and consistent. 5) Roll into small cake balls and place on wax paper. You can use a small melon scooper to make them all the same size, but since the cake mix is kind of sticky, I found it easier to just use my hands and approximate the size. 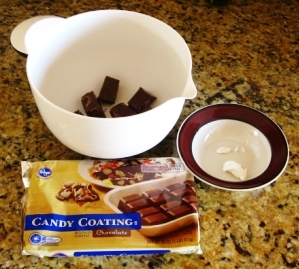 6) Break off half of the chocolate candy melt package and microwave for 1 minute. Stir and then microwave in 30 second increments, stirring each time until smooth. Microwave about 1 tsp of shortening for 1 minute and stir into coating to help keep it smoother longer. You will have to heat the second half of the package about midway through the dipping process. 7) Use a fork to dip and coat the cake balls in the candy melt. Flip the ball onto the wax paper and then smooth the fork edges with a little more coating. (Optional: you can freeze the cake balls for 20 minutes first so they're firmer during the dipping process.) You'll have a lot of extra cake balls, so you can cover some with sprinkles to serve individually. 8) Freeze the chocolate-covered cake balls for ~1 hour while you begin prepping the cookie dough. 9) For the cookie dough, combine flour, baking soda and salt in a small bowl. Beat butter, shortening, white sugar, brown sugar, and vanilla with a mixer. 10) Add in one egg at a time, beating after each addition. Slowly add in flour mixture, using a spatula to scrape down sides of bowl as needed. 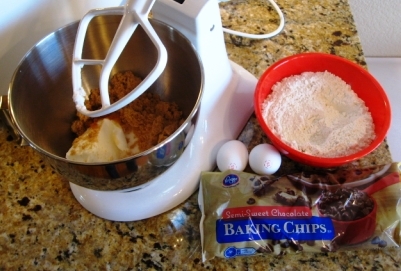 11) After using the mixer, manually stir in the chocolate chips with a wooden spoon or hands. 12) Once the cookie dough is done, take a scoop of cookie dough (maybe 2 Tbsp worth), place a cake ball in the middle, and place another scoop of cookie dough on top of it. Roll the 3 layers into a sphere that completely covers the cake ball. my family would go bonkers for those cakeball cookies. Green would be fun for St. Patty's day! I've never heard of gender reveal cookies, so I had no idea someone could have a favorite! But I love your tutorial and these look yummy. @Not Jenny - What a brilliant idea, to make green cake ball cookies for St. Patrick's Day! @Marie - I know, I'd never heard of gender reveal cookies either! They were an absolute hit (I think shortening makes all chocolate chip cookies taste divine ^_~). A stick of butter is 1/2 cup. You say add a cup but mention a stick of butter. Should I add 2 sticks? So do you use 1 cup of butter or 1 stick in the recipe? 1 stick of butter is 1/2 cup. Sorry about the mistake! It should be 1/2 cup of butter and 1/2 cup of shortening. Correction made today! Hi can the cookies be made without dipping the cake balls in chocolate? @AnneMarie - Yes, definitely! 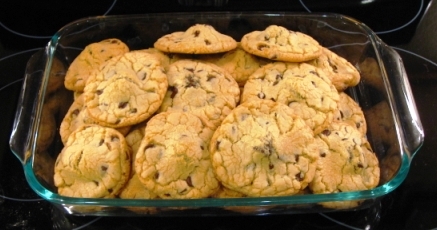 Although, if you're just wanting to make a chocolate chip cookie, I highly recommend this recipe I posted on my blog. Good luck! About how many cookies does this recipe make? I can't wait to open the envelope and finally find out what gender.. And I can't wait to try this cake/cookie, so excited!! @yjshimize - I'm so sorry to admit that I don't remember, and the original recipe has been deleted. I remember I ended up with more cake balls than cookies, which is why I decorated the extra cake balls with sprinkles. If you find out, let me know. And congratulations on the upcoming baby! !